My grandfather John M. Dever was a Signaller during WWI and he came home to Montreal with a few souvenirs from his time in overseas. France Oct 26/18 Picked up a few yards from the front line. I have often wondered about the artist and the subject but I have not had any success finding information about either. If you have any suggestions I would love to hear them! The address was a little more difficult, so with possible errors –“Kasimir Gollensteiner”, (Fussersatzabteilung, 2.Batterie), can’t read the third line. Fourth line says “Deutsche Feldpost”, German military mail. The enemy is listening! Caution on the phone! I am grateful to have these items of my grandfather’s. 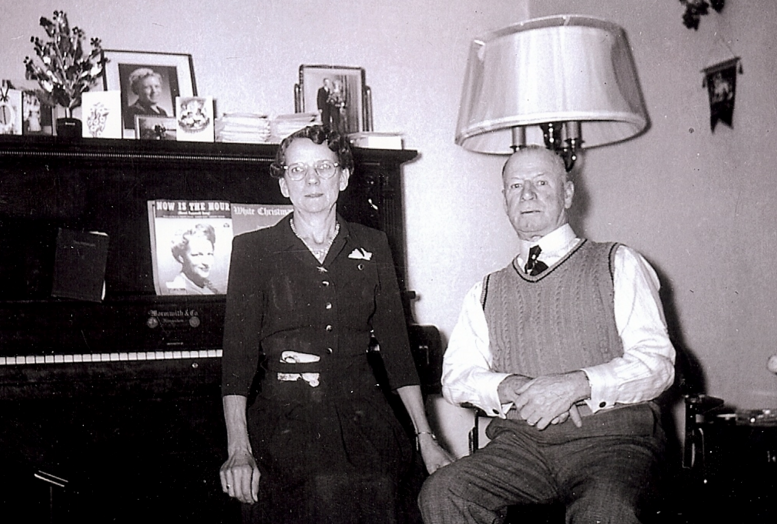 Alfred was born in Sorel, Quebec in 1888 to parents Thomas Lee Norton, a baker and his wife Esther Douglas, joining siblings Thomas Lee and Alyce May. Four more children were born after Alfred but only one of his younger siblings survived. When Alfred was ten he lost two family members, his newborn brother Arthur died in February and six days later their mother Esther died as well. After losing their mother things became tough for the Norton children, the 1901 census reveals Alfred’s sisters living in an orphanage while Alfred is nowhere to be found. The only photograph I have of Alfred. 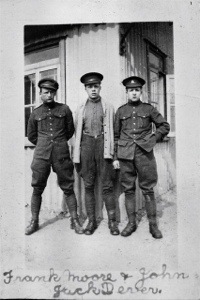 At the age of 26, Alfred signed up for WWI on 26th September 1914 at Valcartier, Quebec. It wasn’t his first military foray, he had previously served for three years in the 8th Royal Rifles and two years with the QOCH (Queens Own Cameron Highlanders). At the time of enlisting Alfred had hazel eyes, brown hair and was standing a tall 5’7″, his occupation is a clerk. Alfred sailed out on the S.S. Andania and served in England and France. After the war, Alfred returned to Montreal where he went back to working as a clerk. He married Elizabeth Walker Johnson in 1930 at the St. Giles Presbyterian Church. Alfred’s heath may have suffered from his war service as he died suddenly at the age of 42 with no children. Alfred is buried in Mount Royal Cemetery in Montreal, Quebec. In rural Saskatchewan (before it was a Province) in a small town called Indian Head, Benjamin Nelson Harrop was born on a fall day in October, 1894. Growing up on the farm, helping his father William with chores seems a long way off from piloting planes in WWI but that is where life took him. Benjamin received his certificate on a Maurice Farman biplane at the Royal Naval Air Station in Eastbourne in 1916. While in England he married Cecil Powel in 1917 and at the end of the war returned safely to Canada with his bride. In WWII he became Wing Commander and was the chief supervisor at an Air School in Winnipeg. Benjamin spent his life as a pilot. I was able to locate his death record on the Royal B.C. Museum database and upon learning he died in Kelowna a search at Find-a-Grave lead to me to his headstone.